On Monday 16 June 2008 we ate breakfast at 7:00 in our hotel in St Goar. We went to the Beer Stein Shop to see the beer steins and for some information and then to the Cuckoo Clock Center with beautiful cuckoo clocks (but very expensive). Just before 8:00 we went outside to see the largest Cuckoo Clock in the world strike. We also did a bit of souvenir shopping before getting on the bus. At 8:15 the bus departed to Munich, Germany. We drove through small towns with cheerful buildings with flowers in the windows. The Rhine River is pretty and the slopes are full of vineyards and castles. The road got very busy with a lot of trucks and some road works and we were later than expected. At 11:25 we stop for a 45-minute lunch break. We eat brötche and bratwürste with some cool drink. We had to pay €0.50 to use the bathroom. In exchange we got a voucher of €0.50 to use when buying food. So in the end it worked out all right. The toilets are very interesting. They have a sensor and flash as soon as you get up and then a sponge / brush wipes the seat. By 12:05 we were on the road again. At the Leonardo Hotel in Munich we took out bags to our room and at 16:45 we were back in the bus to go on “Mike’s Bike Tour” of Munich. Everybody go a bike and then we split in 2 groups. The tour was fun but it took a while to get use to riding on the right side of the road (In South Africa we use the left side). The streets were busy and it was still cold but wasn’t raining. This square was named after King Maximilian Joseph, the first king of Bavaria. There is a monument of him in the square. The National Theatre built in 1818 is also in the square. We saw the Feldherrnhalle or Field Marshal's hall. This is a covered hall with three arches with statues inside. Then we saw the beautiful Theatinerkirche and also the Residenz Palace. We stopped at the Bayerische Staatskanzlei or Bavarian State Chancellery built around the restored section of the Army Museum. 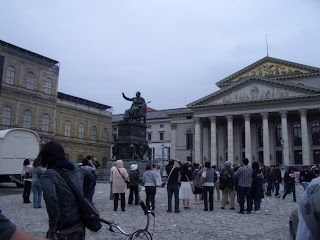 We really enjoyed Munich when we visited earlier this year! I keep trying to get Le Husband to go on a cycling tour but he keeps reminding me that I might just be the only person ever who has forgotten how to ride a bike. 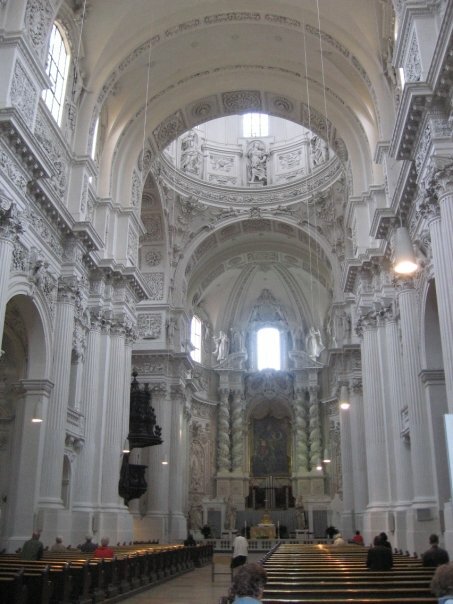 We loved the Theatinerkirche. I must have taken a hundred photos in there.